For Samuel Adams beer, see Samuel Adams (beer). 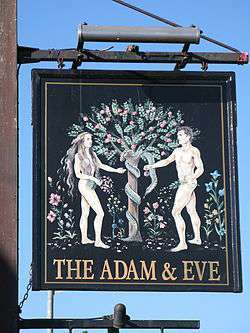 Visitors to the Adam and Eve public house in Prudhoe, Northumberland, may drink "Adam's ale". Adam's ale (also referred to as Adam's wine, especially in Scotland; sometimes simply called Adam) is a colloquial allusion meaning water. It alludes to the idea that the biblical Adam had only water to drink. This inference gained popularity around the beginning of the 19th-century temperance movement. "Adam's ale" means unadulterated water, based on the presumption that the biblical first man Adam had only water to drink in the Garden of Eden. Common variations are "Adam's wine" in Scotland, and sometimes simply "Adam". The phrase is an allusion, colloquialism, epithet, and idiom. In common use until the mid- to late 20th century, usage of the phrase has declined. The earliest known printed occurrence of "Adam's ale" is attributed to William Prynne's The Soveraigne Power of Parliaments and Kingdomes, which was first printed in 1643. [W]hat hurt will it do me to drink of this water?' Our father Adam had nothing better for his wedding-day, and before the earth was cursed, or sin had entered it, Paradise produced nothing better than this pure element. It was the drink of Adam and Eve when the morning stars sang together, and when the sons of God shouted for joy. Philip Freneau wrote a poem that was an aid to the early teetotalism movement. 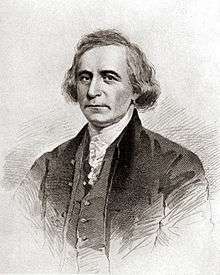 Freneau (an American) was captured in 1780 by the British while on a voyage in the West Indies during the War for Independence. After his release he wrote the poem called, The [Terra Cotta] Jug of Rum, criticizing alcoholic beverages. An excerpt from this literature shows a poetic use of "Adam's ale": "A spring that never yet grew stale—— Such virtue lies in—Adam's ale!". Later on Freneau used the phrase in a second poem concerning a legislative act prohibiting the use of spirituous liquors by prisoners in certain jails of the United States. 1 2 Panda, Maheswar (1999). "8 Use of Idioms and Phrases". The Sterling Book of Words & Their Usages. Sterling Publishers Pvt. Ltd. p. 130. ISBN 978-81-207-2006-0. 1 2 3 The Facts On File Dictionary of Classical and Biblical Allusions. New York: Facts on File Inc. 2003. p. 7, Adam's ale. ISBN 0-8160-4868-1. ↑ Brewer, Ebenezer Cobham (1894). The Wordsworth Dictionary of Phrase and Fable. Wordsworth Editions Ltd. p. 13. ISBN 1-84022-310-3. 1 2 Farmer, John S. (1891). Slang and its Analogues. p. 20, Adam's ale. ISBN 978-1440072468. ↑ Jeffrey, David Lyle (1992). "Adam's ale". A Dictionary of Biblical Tradition in English Literature. Wm. B. Eerdmans Publishing Company. p. 21. ISBN 0-8028-3634-8. 1 2 Martin, Gary. "Adam's ale". The Phrase Finder. Retrieved July 14, 2015. Adam's Ale [Def. 1]. (n.d.). In Merriam-Webster Online. Retrieved July 16, 2015. Prynne, William (1643). The Soveraigne Power of Parliaments and Kingdomes. p. 32. ISBN 978-1130166835. Epochs And Episodes Of History. Ward, Lock, & Co. 1882. p. 673–674 Adam's Ale and Noah's Wine. ISBN 978-1172715954. "Total abstinence from all that intoxicates". Journal of the American Temperance Union: 91, 96, 124, 151. January 1837. ISBN 978-1274383778. 1 2 Beggs, Thomas (1846). The Proceedings of the World's Temperance Convention, 1846: Held in London, Aug, 4th and Four. p. 31. Print. ↑ Journal of the American Temperance Union Volume 4 Issue 6. January 1837. p. 96, Early Te-totalism. ISBN 978-1274383778. 1 2 3 Lees Dr. F. R. (1884). "6 National Intemperance and Remedy". The Science Temperence Text-Book. The National Temperance Publication Depot. pp. 199–200. ISBN 978-1293389225. Freneau, Philip Morin (1809). Poems written and published during the American Revolutionary War. Press of Lydia R. Bailey. p. 102–103, Poems on Several Occasions. ISBN 978-5518915145. Fairfield, Sumner Lincoln (March 1833). "American Poetry. Freneau's Poetical Works.". The North American Magazine. C. Sherman & Co. 1 (12): 288–290. ISBN 978-1154128178. 1 2 Pattee, Fred Lewis (1907). The Poems of Philip Freneau – Volume III. The New Era Printing Company. pp. 67, 126, On a Legislative Act. ISBN 978-1512047042.